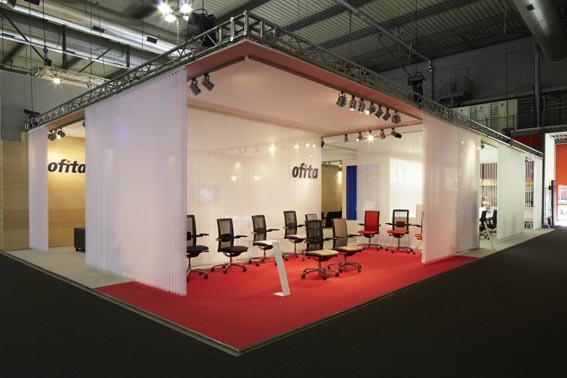 Ofita has just exhibited its products at the Salone Ufficio in Milan, one of the most important fairs in the sector in which the top names of international design take part. We should particularly highlight the excellent reception of the novelties presented by Ofita at this fair: the Iroha chair, designed by Isao Hosoe, and the iSurf “intelligent surface” table – a new table with integrated technology for active and modern communication in all its forms. It allows for the efficient use of multimedia presentations by groups -both in situ and via the internet-, work teams, training, etc. iSurf incorporates innovative connectivity at the centre of the table, facilitating communication and providing a tidy work space. From the table itself you can control the lighting, blinds and air conditioning, also allowing each user to connect their laptop to a central connection system. On an LED screen placed on the wall you can visualise the information that each person is accessing on their computer, even via wireless.